Drs. Juriga and Sasser have donated their time and provided advanced dental services to the Brookfield Zoo and The Shedd Aquarium. 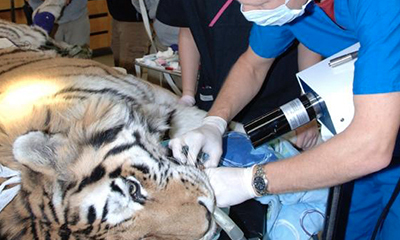 The Veterinary Dental Center has provided dental services to zoo and aquarium patients since 2005. Drs. 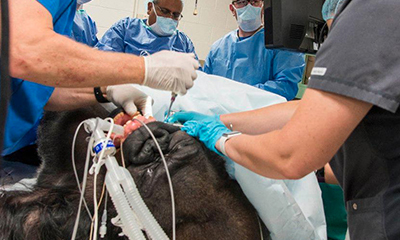 Juriga and Sasser consult with the zoo veterinarians on each patient’s oral condition, diet and function prior to performing the oral examination and X-ray imaging to determine the best treatment plan. 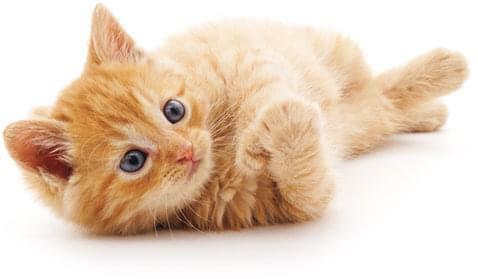 We are blessed to have a highly trained zoo veterinary and technician staff that provides the anesthesia to perform these dental and oral surgical procedures. Packing for the zoo includes specialized instruments and dental materials selected for the challenges in the zoo animals tooth structure and size (length). For example, human dentists routinely use root canal files that range from 21-25 mm, while in our dogs’ veterinary dentist use files from 50-60 mm and in tigers/bears we utilize files up to 120 mm. 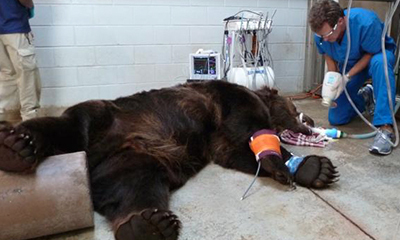 Bear receiving root canal therapy. 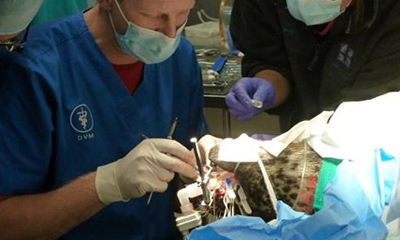 Harbor seal with gingivitis receiving treatment.